Ed Klein’s latest book, Guilty as Sin, exposes Hillary’s life of corruption case by case, but her fatal flaw, dishonesty, weaves itself through each and every sin. Hillary Clinton cannot help but lie—it’s natural to her at this point. Here are 7 of Hillary’s biggest lies as exposed in Guilty as Sin, which together point towards her being a pathological liar. TRUTH: Only one out of four of Hillary’s grandparents were immigrants. Why did she have to exaggerate and lie about three of them? That’s just what Hillary Clinton does. TRUTH: Over two thousand classified documents were found on her email server, and at least twenty-two of those classified documents were classified GREATER than top secret. Hillary Clinton stated that mega-donors to the Clinton Foundation did not receive special treatment while she was secretary of state, but eyewitness accounts, as documented in Unlikeable: The Problem with Hillary, tore that lie to shreds. TRUTH: Wealthy foreign donors DID receive special treatment, including a Canadian businessman, who after donating to the Clinton Foundation and paying Bill Clinton an honorarium of half a million dollars, was allowed to sell control of 20 percent of American’s uranium production capacity to Russia. Sounds like special treatment to me. Hillary Clinton claimed that she voluntarily turned over all of her work emails to the State Department, but volunteering usually doesn’t require the force of a subpoena first. TRUTH: Hillary Clinton was not going to turn over those emails, until a subpoena forced her to, and even then, she withheld several Benghazi-related emails exchanged with non-State Department employee Sid Blumenthal. The impetus behind Clinton’s private, poorly secured email server was “convenience,” she and her staff claimed. This convenience included the ability for Clinton to only use one phone, because two or more would have been too much to handle. TRUTH: Clinton owned SEVERAL electronic devices, and she wasn’t even the one who carried them. Her right-hand-woman, Huma Abedin, had that honor. 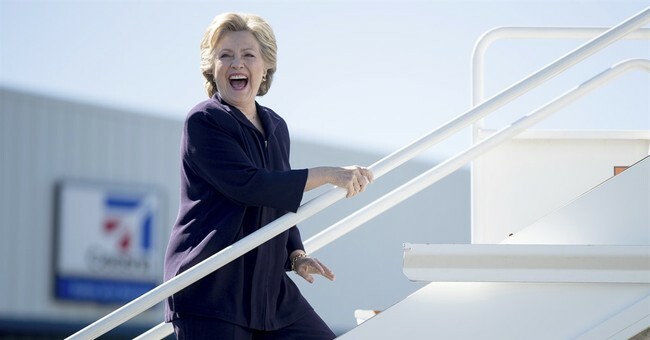 In an attempt to cover her own hind end, Clinton had the audacity to claim that Colin Powell, former Secretary of State and one of the most respected statesmen in the United States, told her to circumvent the law and use a private email server. To see more Clinton lies exposed, pick up Guilty as Sin by Ed Klein.